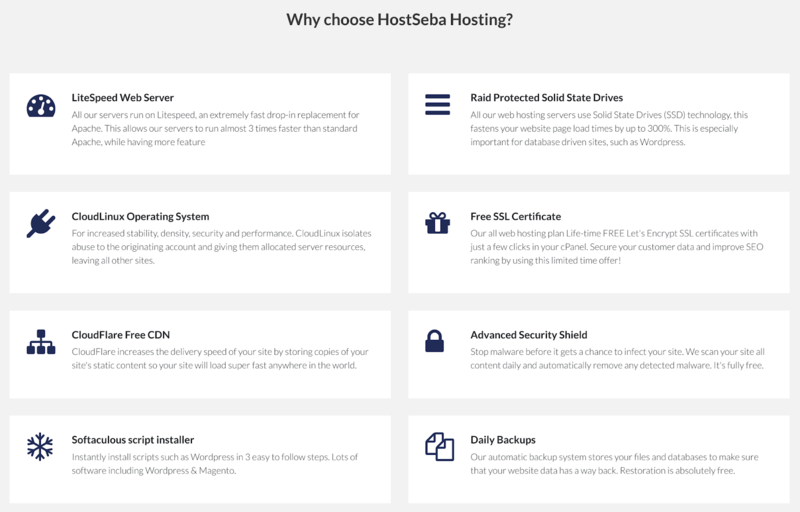 HostSeba Review 2019: Is HostSeba a Good Hosting? In business since 2012, HostSeba beats many of the older web hosting providers with its affordable yet extremely powerful and reliable servers that utilize innovative technology. Besides its beginner-friendly shared hosting plans, this vendor also offers VPS, cloud, reseller, and dedicated server hosting. HostSeba was founded in 2012 by experienced web hosting professionals. Despite being relatively new to the hosting market, they’ve established a reputation as a reliable hosting provider that stays true to delivering trouble-free and customer-focused enterprise-level solutions at affordable prices. Although their base market is Bangladesh, they also serve customers in other countries from servers located in their Dallas, Los Angeles, New Jersey, and Buffalo data centers. HostSeba’s servers use fast RAID SSD technology that speeds up website load times by up to 300%. They also use the LiteSpeed Web Server that can handle more traffic and deal with DDoS attacks more effectively than Apache. In addition, the CloudLinux operating system separates shared server users thereby increasing stability, density, security, and performance. And their use of innovative technology doesn’t end there, because their CloudFlare CDN stores copies of your website’s content in different data centers to speed up local load times. Softaculous and Fantastico allow you to set up numerous web applications with just one click from your cPanel control panel. The SitePad drag-and-drop website builder helps you set up a website in minutes by choosing from the hundreds of available themes. CMS hosting plans give you your chosen CMS pre-installed and optimized. HostSeba has something to suit almost any budget. The starter plan is priced low yet filled with numerous excellent features such as a free SSL certificate, advanced security, and superb server performance. All the other plans – including cloud, VPS and dedicated hosting – are equally affordable, and HostSeba clearly states on its website that there are no hidden charges. Backups, hosting setup and website migration services are free unlike with some web hosting providers, and you get a 30-day money-back guarantee that reduces your initial sign-up risk. HostSeba’s customer support is superb. They have openly available live chat, and their support telephone number and email address are both displayed clearly on their website. Once you’re signed up, you can also log in to your client area to submit a support ticket that should receive a response within the hour. If you like to support yourself, you can use their in-depth knowledge base to solve your own issues. Despite being relatively new, HostSeba runs rings around some older web hosting providers due to their high-level performance, reliability, and customer service. The only real downside is that they don’t offer Windows shared hosting packages. Check out HostSeba’s web hosting options today! Wondering how HostSeba stacks up against other Web Hosting companies? Enter any other Web Hosting company and we will give you a side-by-side comparison.